A monster supercell on May 22, 2014 produced giant, destructive hail and an EF-3 tornado just west of Albany, New York. 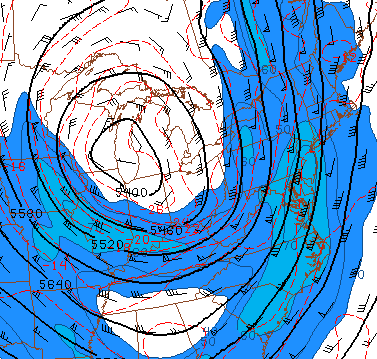 In general, the event was poorly forecast. BUT AGAIN THAT IS A VERY LOW THREAT. I don’t think anyone (myself included) expected a long-lived supercell producing a long path of significant severe weather. The storm gave us an opportunity to look at how this supercell looked with dual polarization radar – a relatively new tool in our severe weather arsenal. The storm started out with a classic large hail signature in Fulton County, NY to the north of the New York State Thruway. The above video from the town of Broadalbin shows baseball size hail falling from the storm. While low level rotation was unimpressive the mid level mesocyclone was cranking. From a dual pol perspective this was a classic large hail case. A large area of high reflectivity (near 70dbz in places) with ZDR near 0 and pockets of low CC. Because hail tends to tumble as it falls it appears spherical to the radar – hence a differential reflectivity near 0. Not shown is KDP which is fairly low over Broadalbin – only about 1º/km showing that liquid water was not a large contributor to the high reflectivity – the hail was! In addition, a three body scatter spike (note very low CC downraidial of hail core) was present from the lowest elevation slice (near 2,000 ft AGL) all the way up to 20,000 feet! Storm top divergence was also approximately 100 knots which is impressive for a northeastern US supercell. The supercell went on to produce large hail in the town of Amsterdam, NY as well. The largest hail fell in an area with somewhat low reflectivity (55dbz over Amsterdam as opposed to 65-70dbz farther east). 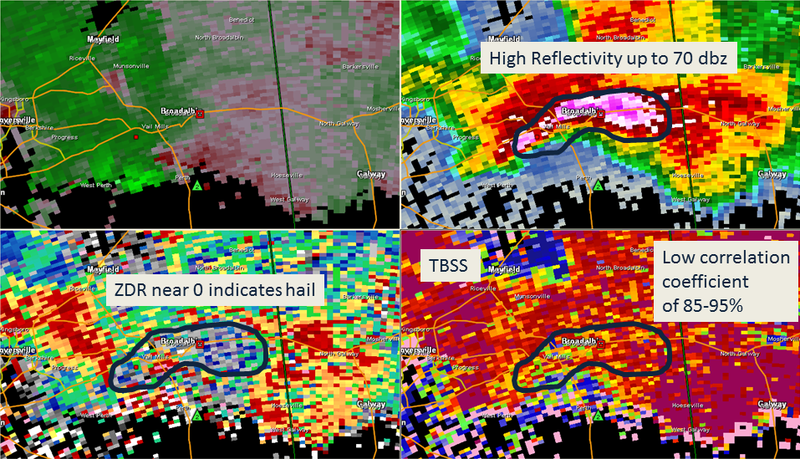 This is another example of why dual pol variables are better at detecting large hail than using reflectivity alone! Picca and Ryzhkov (2012) showed giant hail detection is possible by locating areas of wet hail growth above the freezing level, and in particular, in the hail growth zone near -15C. They cite CC <0.9 and ZDR <0 as clues. This event showed that signal over Amsterdam when giant hail was indeed falling. 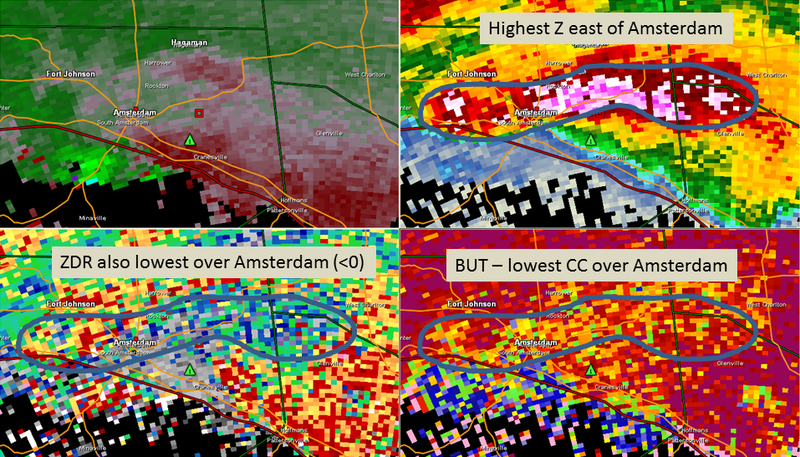 You can see very large Z near Amsterdam at 9500ft coincident with sub-zero ZDR and CC <0.9. 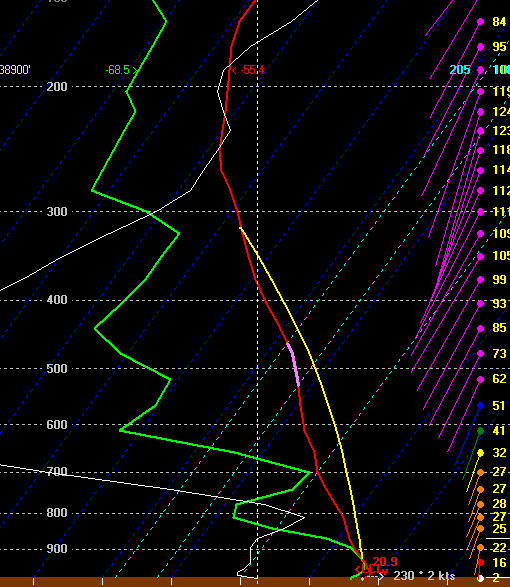 This signature is also present up into the hail growth zone above the -10C isotherm. Rapid tornadogenesis took place following the large hail reports north of the Thruway. At 1928 UTC there is some sign of a reflectivity appendage at the lowest tilt. In addition the mid level mesocyclone is beginning to descend (not present at 0.5º or 0.9º tilts but is higher up at 1.3º). This was a tough event to warn for – as there weren’t many clues until the tornado was touching down. By 1933 UTC tornadogenesis has occurred with a 56 knot gate-to-gate delta-V at 900 ft AGL. The tornado warning came out at 1939 UTC. By 1942 UTC a weak tornado debris signature is present and by 1951 UTC a clear tornado debris signature is present with very low CC, high Z, and near zero ZDR. 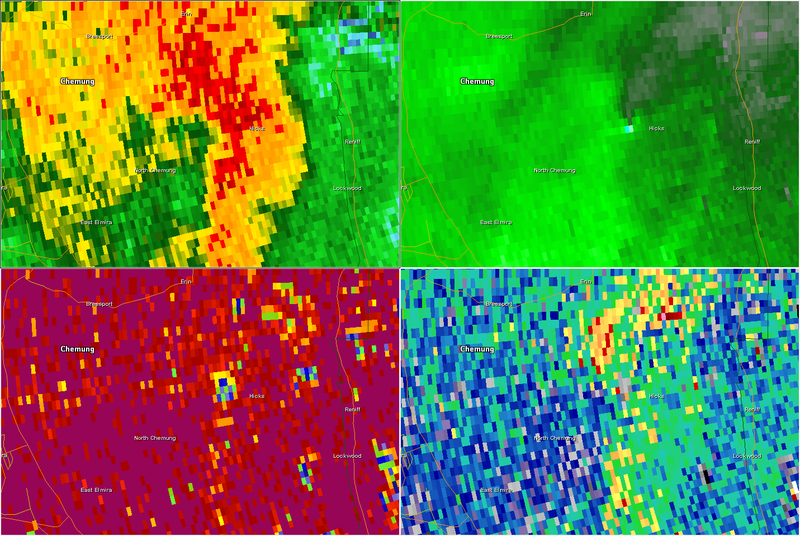 Given the strength of the tornado (EF-1 to EF-3), the proximity to the radar site, and the path of the tornado (through heavily wooded areas) I’m very surprised the TDS was not more dramatic. The “slam dunk” TDS only lasted 1 volume scan and only extended up to about 3500 ft AGL. Not particularly impressive. 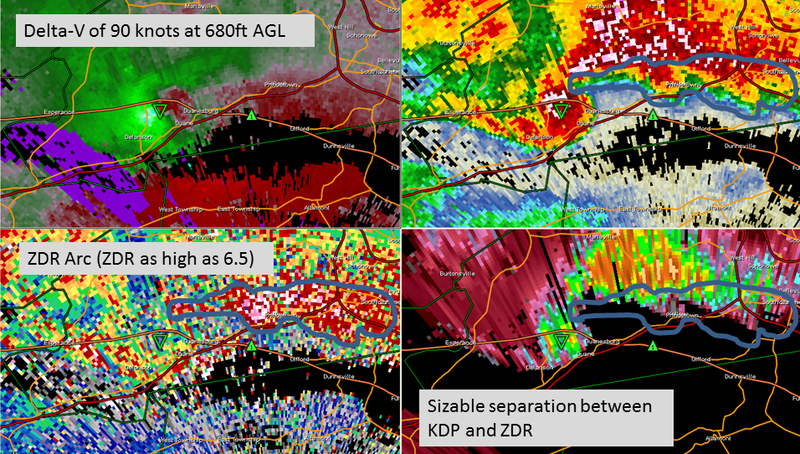 One possible explanation for the relatively unimpressive debris signature was that there was a tremendous amount of rain and hail that was wrapped into the rear flank downdraft (KDP and Z quite high and ZDR near zero) that could have skewed the correlation coefficient higher than you’d typically expect with hydrometeors beings the dominant signal? 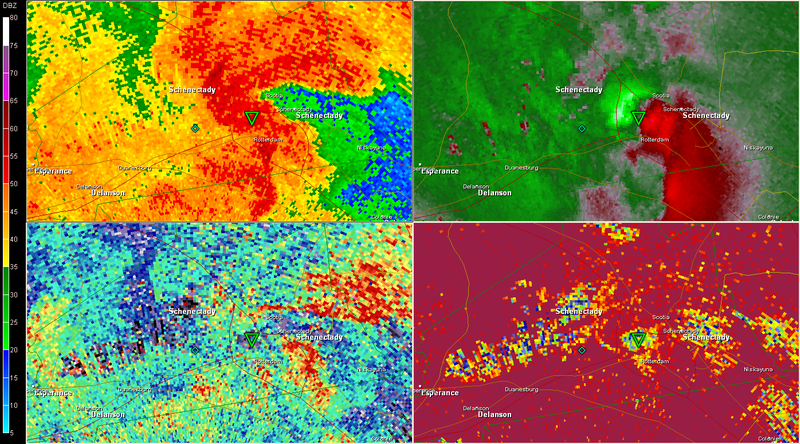 One other interesting feature is the presence of a ZDR arc shortly after tornadogenesis. The ZDR arc did not precede the tornado which frequently happens (no benefit for the radar operator) and was somewhat unusual because it appeared so rapidly. You can see the ZDR arc here at 1947 UTC along the reflectivity gradient of the storm’s forward flank. 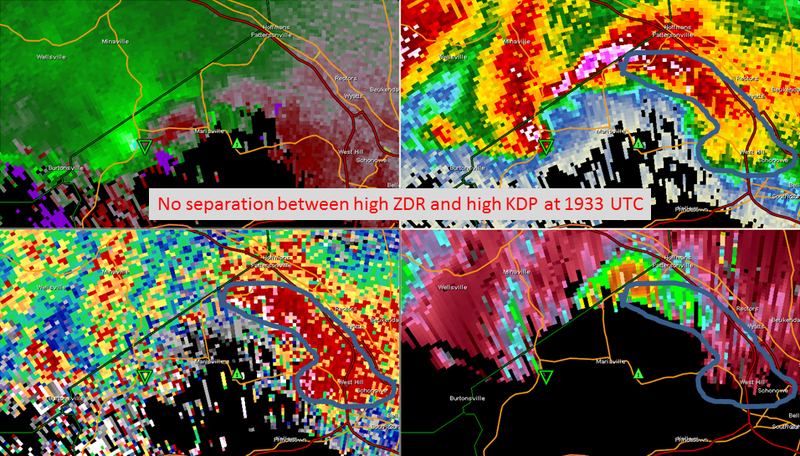 ZDR is quite high in places (nearly 7db) and there is clear separation between high ZDR and high KDP. This is an example of hydrometeor size sorting in a highly sheared environment. The high ZDR is indicative of large drops and the smaller drops are getting pushed farther into the storm’s forward flank where KDP shows high water content. 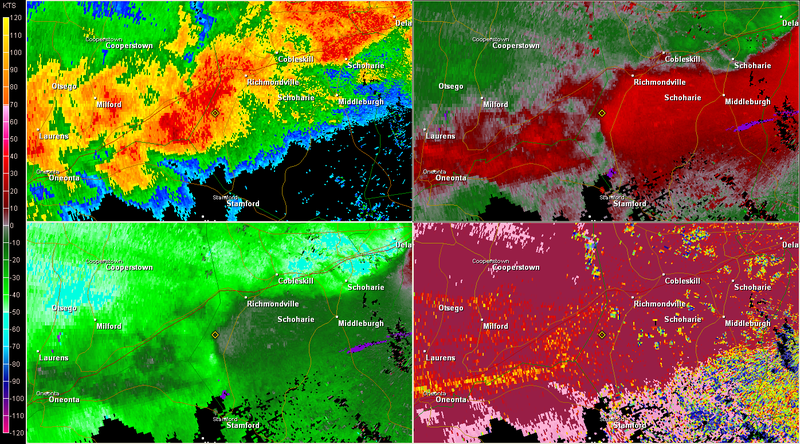 The ZDR arc appeared as the tornado reached its maximum intensity (EF-3) in Duanesburg. The sudden appearance of a ZDR arc might indicate that the storm was moving into a more strongly sheared environment where hydometeor size sorting occurred quickly. Not surprisingly, this is where the tornado was the strongest. At the time of tornadogenesis there is a region of high ZDR displaced well east of the low level mesocyclone but it is coincident with high KDP indicating little separation from size-sorting. Prior to and during tornadogenesis there was no real signal from a ZDR arc to help forecasters with this storm. 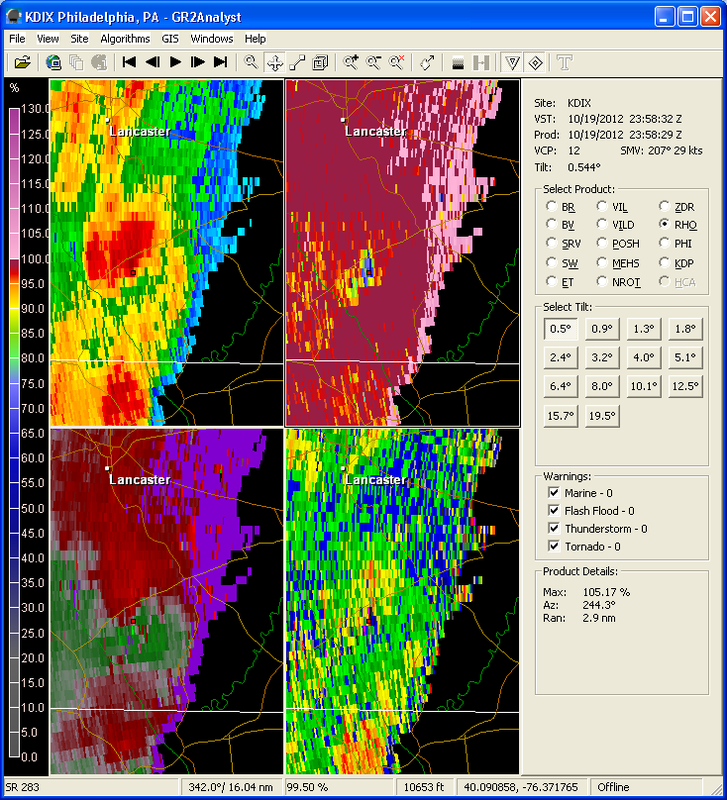 The EF-3 tornado provided a unique opportunity to view the dual pol characteristics of this northeastern US supercell. Unfortunately, the storm’s rapid tornadogenesis was preceded with few, if any, clues on radar. When the tornado was on the ground the debris signal was surprisingly muted (many far weaker and farther from the radar tornadoes have produced much more dramatic TDS around here) but did eventually give forecasters confirmation of a tornado in the absence of any reports in real-time. As expected, the National Weather Service has confirmed the 2 tornadoes that radar confirmed on Wednesday, May 29th and one additional tornado in southern Saratoga County. The Schoharie and Saratoga County tornadoes were rated EF-1 while the Montgomery and Schenectady County tornado was rated an EF-2. The tornadoes occurred in a modestly unstable environment. The 18z 4km NAM by 22 UTC had 1283 j/kg of MLCAPE at KALB but also had an impressively long hodograph that veered with height particularly in the 0-1km layer. A backed boundary layer flow underneath 700mb winds of 50 knots produced impressive shear that aided in storm organization and lead to tornadogenesis. 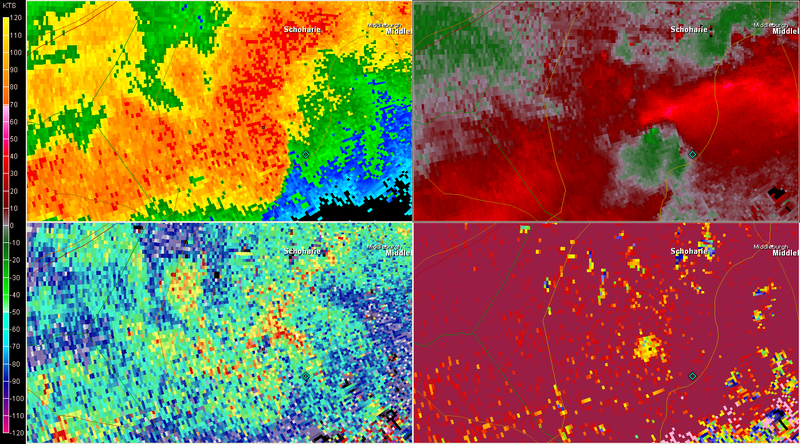 The 2 tornadoes that produced tornado debris signatures (TDS) on doppler radar give us a useful learning lesson in just how powerful dual polarization technology can be. In the northeast, the presence of heavily forested areas will likely make TDS relatively easy to spot and there may be a larger percentage of tornadoes that produce TDS here than in the plains. I also expect dual polarization to result in an increase in tornado reports since, in many cases, we’ll know exactly where to look for tornado damage even in the case of a tornado moving through a very rural area. The tornado that touched down in Schoharie County was on the ground for 2 miles and a total time of 5 minutes according to the National Weather Service storm survey. 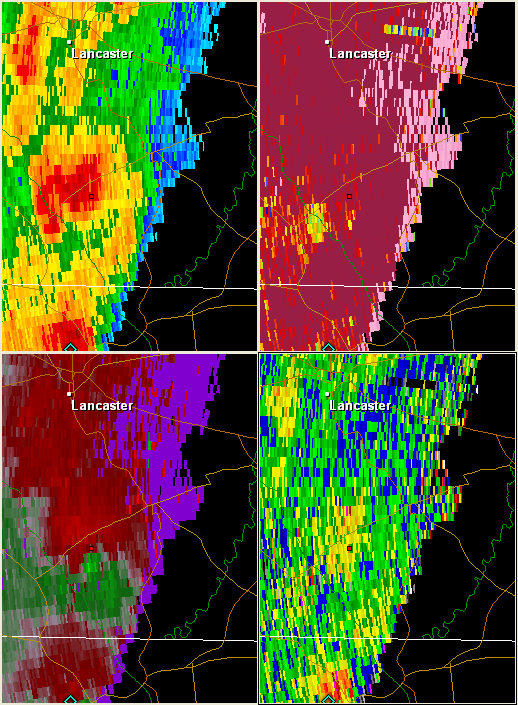 The tornado touched down at 6:57 p.m. At that time KENX radar showed a gate-to-gate LLΔV of about 75 knots at about 1500 ft AGL. The TVS was only present for one volume scan at 0.5º base velocity and then the rotation broadened with 75 knots of LLΔV separated by about a mile . By 7:02 p.m. there was a significant debris signature with very low CC, co-located with ZDR near zero, and the remnant circulation. 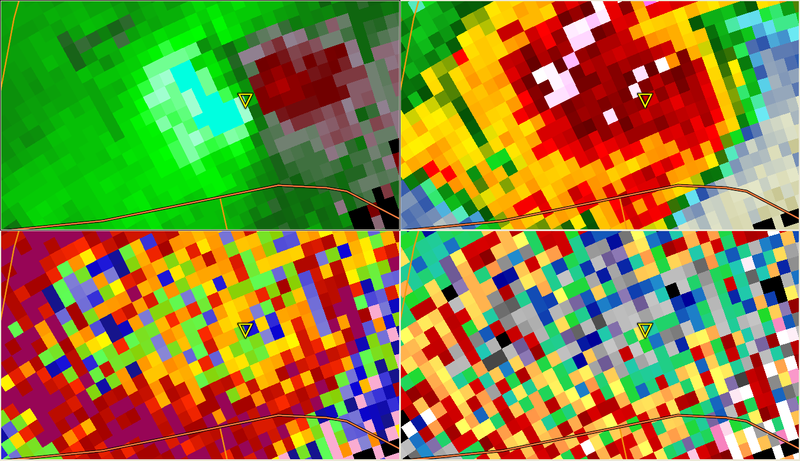 Within 5 minutes the tornado lofted enough debris to produce a significant TDS. 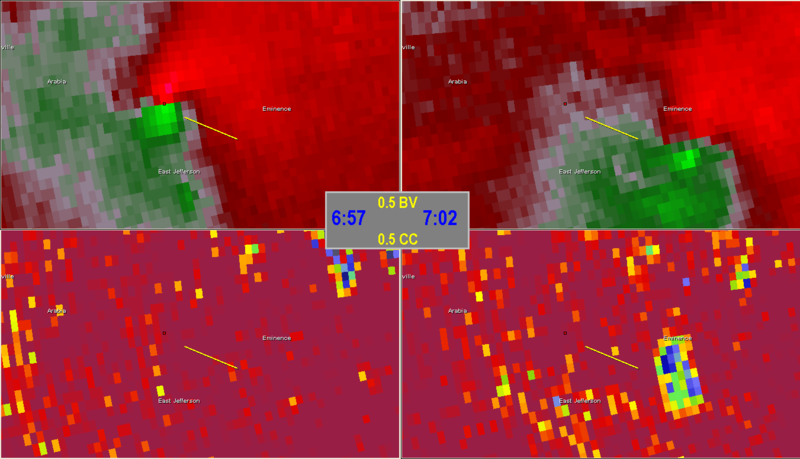 The TDS was still present, though much less impressive, by the 7:07 volume scan. The debris was picked up by radar within 5 minutes of touchdown and lingered for 5 minutes after the tornado lifted up. 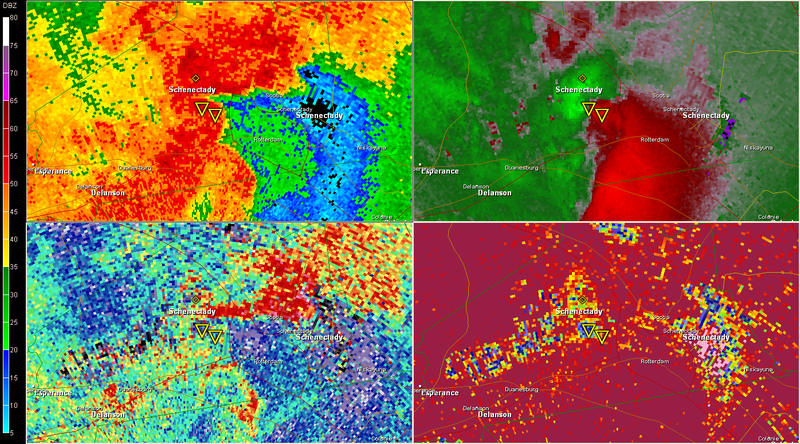 The signal was probably even stronger given the close proximity to the radar site. 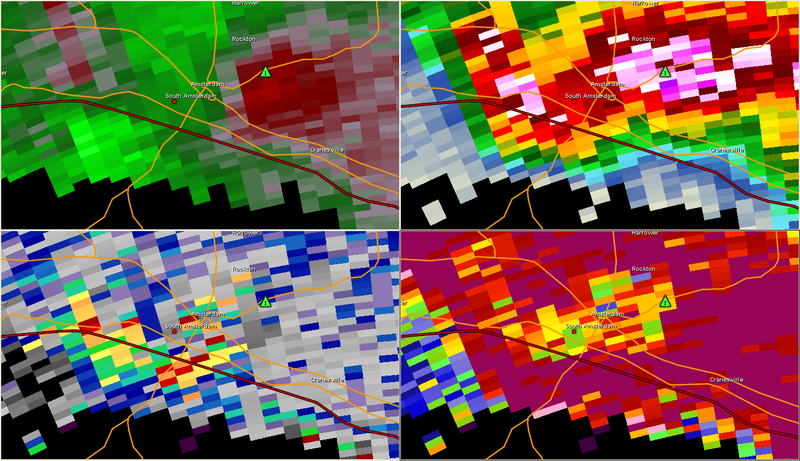 The radar was sampling the storm at only about 1500 ft AGL on its lowest slice. 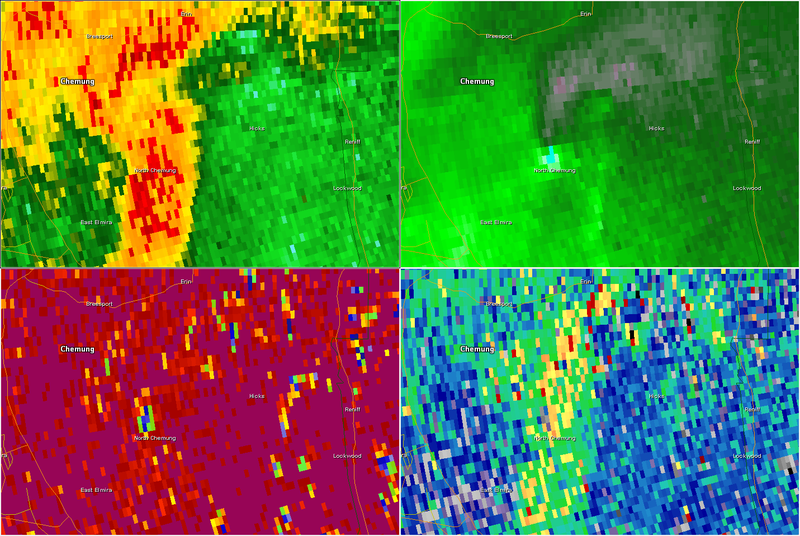 The TDS was also visible on the 1.4º slice at approximately 3500 ft AGL though it was weaker. 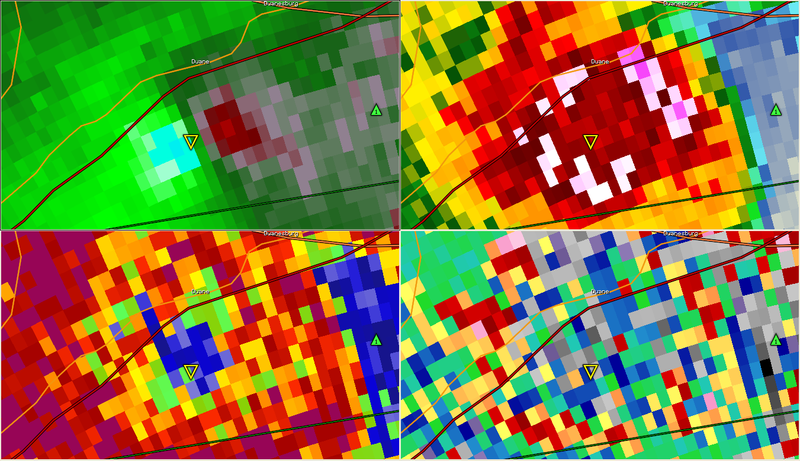 The TDS was not visible on the 2.4º slice or ~5500 ft AGL. If this storm was more than about 40 miles from the radar it is certainly possible that the TDS wouldn’t be picked up at all and if it was a bit farther than that the low level mesocyclone on the QLCS would have been overshot as well. The tornado in Montgomery and Schenectady Counties was the only significant tornado of the day with an EF-2 rating. It was a mile wide for most of its life and was on the ground for many miles ending just past the New York State Thruway in Rotterdam. While the Public Information Statement from the NWS says the tornado was on the ground for 17 miles based on the coordinates of its beginning and end location I’m coming up with only 12 miles. I’m not sure what the discrepancy is here. The National Weather Service storm survey puts the touchdown at 6:47 p.m. which seems too late by about 4 minutes per KENX radar. Radar shows the tornadic circulation over the beginning part of the track at 6:43 p.m. (the warning came out at 6:45 p.m.). Around the time of touchdown the rotation was fairly broad, though quite strong, with LLΔV of nearly 95 knots spread over 7 radials (about 3/4 mile). By the time the circulation was over Mariaville the gate-to-gate LLΔV was 95 knots. Very impressive. What’s interesting in this case is that the debris signature doesn’t appear until 6:57 p.m. – more than 10 minutes after touchdown. It took twice as long for the TDS to appear with this tornado than in the weaker and shorter-lived Schoharie County tornado. The 0.5º slice was also sampling this storm at a lower elevation than the Schoharie County storm (900 ft AGL versus 1500 ft AGL). 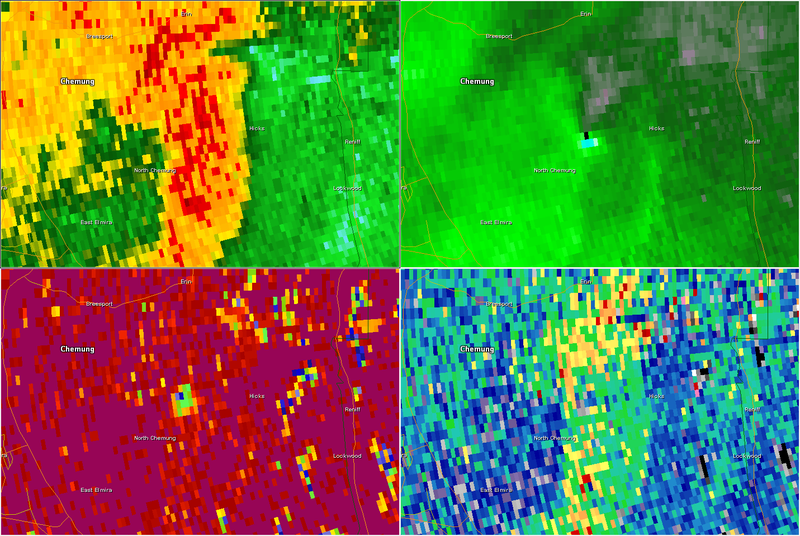 The debris signature was present for 2 volume scans – 6:57 p.m. and 7:02 p.m. before disappearing at 7:07 p.m. Though there is an area of depressed CC and ZDR near the circulation at 7:07 p.m. the values aren’t low enough to classify as a TDS though since the radar isn’t detecting hail in that location chances are there was some small detritus from the tornado being sampled. 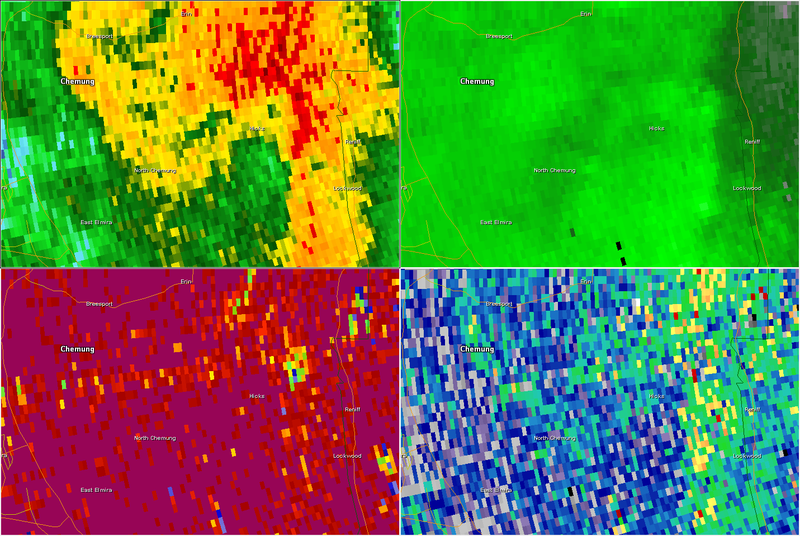 After the storm went through Mariaville, NY there was a debris signature as high as 5100 ft AGL on the 3.4º slice. 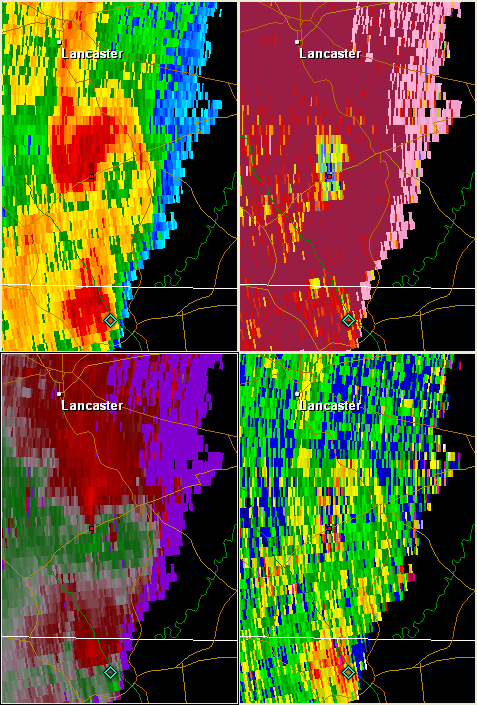 One possible reason by the debris signature took twice as long to appear on the Schenectady County storm is that in the beginning the tornado was moving through mainly farm land. The Schoharie County storm was in a heavily wooded area and approached a state forest. Once the storm moved through Mariaville Lake it encountered homes, buildings, and a more wooded landscape. 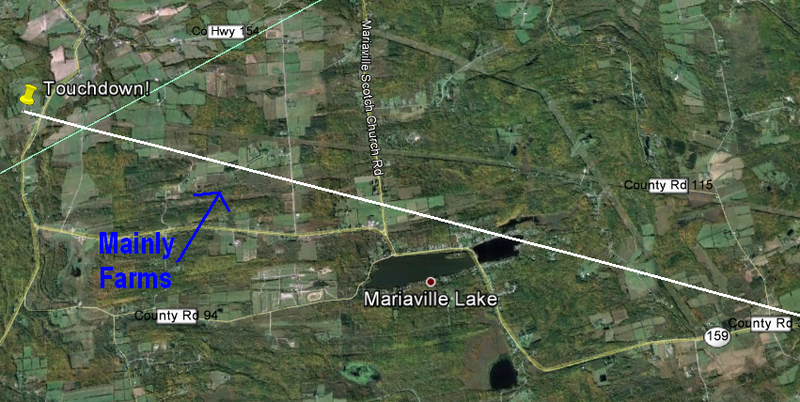 The TDS appears after the tornado moved east of Mariaville Lake. The ability to detect tornado debris will be a huge help in severe weather coverage. Being able to confirm a tornado around here in real time is so difficult due to hilly terrain and the fact many of our tornadoes are rain wrapped. 5/29-5/31 always seems to be a tornado bonanza around Albany, NY. The May 31, 1998 tornado outbreak (F3 in Mechanicville) and the May 29, 1995 Great Barrington (F4) tornado are just some of the examples. On Wednesday at least 2 tornadoes touched down near Albany – both were confirmed by lofted debris on doppler radar. 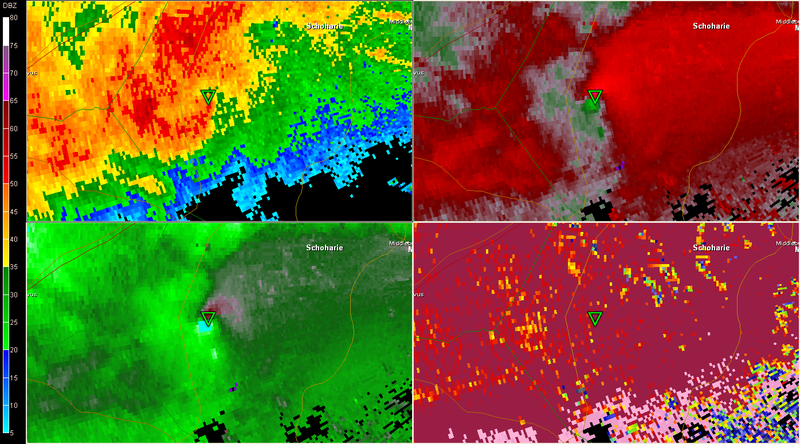 What is really interesting about both of these tornadoes is that both formed from separate convective modes. The tornado west of Rotterdam in Schenectady County was from a discrete supercell being taken over by a strengthening squall line/QLCS. 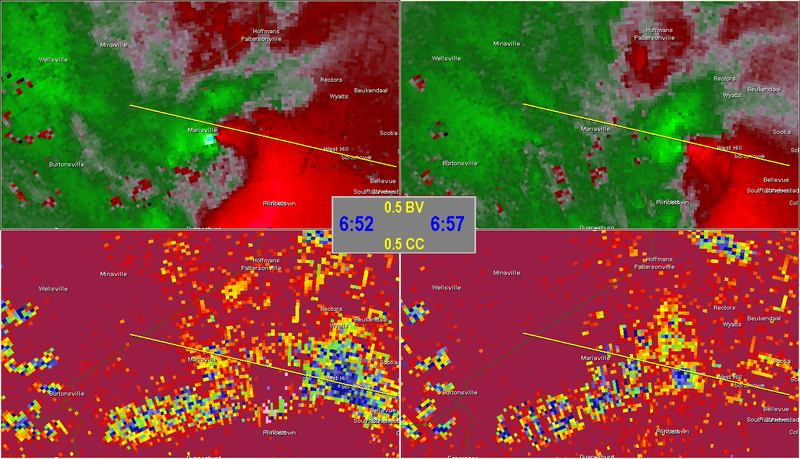 The tornado in Schoharie County, on the other hand, formed on a QLCS from a non-descending mesocylone. 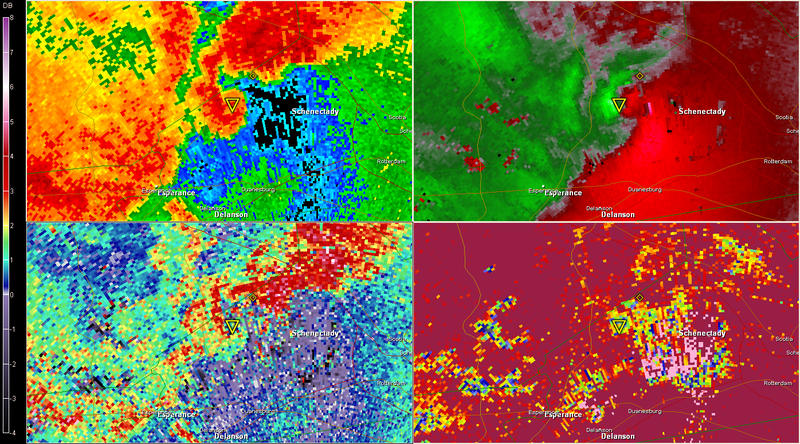 Both tornadoes exhibited brief, but strong, rotation on doppler radar and both featured pronounced tornado debris signatures. One of the most powerful tools from the dual polarization upgrade of the WSR-88d is being able to discriminate between precipitation and non-meteorological targets such as lofted debris. Knowing a tornado is on the ground causing damage can help beef up warning statements and for a TV meteorologist who can identify the tornado debris signature (TDS) it can be used to really hammer home the message that a tornado is on the ground and it’s the real deal. In situations where radar presentations are marginal (especially in the QLCS case) the TDS can be used to issue a tornado warning with zero lead time – certainly better than negative lead time! I’ll start with the supercell near Rotterdam that dropped a tornado in rural Schenectady County. At 2237 UTC you can see the supercell ahead of the developing QLCS. There’s a fairly weak low level mesocyclone near Wellsville, NY near a developing appendage/hook echo. Not shown, but 0.5 base velocity shows a very strong area of low level convergence along that appendage and through the storm there is a fairly deep mesoscyclone through at least 15,000 feet. Also note behind the supercell is a bowing QLCS. 10 minutes later the low level mesocyclone has rapidly strengthened west of Mariaville, NY. Also note the QLCS is virtually on top of the supercell at this point. While the low level mesocyclone is still fairly broad (i.e. not a TS/TVS at the lowest elevation angle) the mesocyclone through the depth of the storm has dramatically strengthened. You can see the appendage has now fully become a hook echo and there’s some evidence of lofted debris with low correlation coefficient and differential reflectivity near 0. 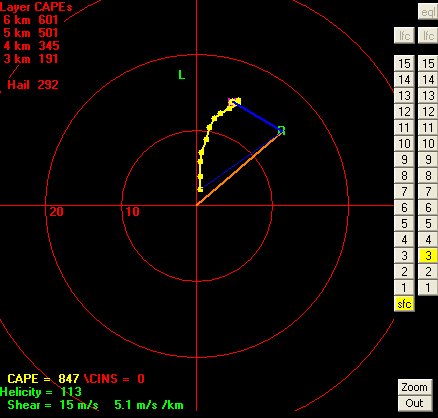 By 2352 UTC as the QLCS has taken over the supercell low level delta V has spiked to 95 knots about 1,000 ft AGL. At 2357 UTC there is a clear debris signal in both Z, CC, and ZDR. The supercell has now morphed, post-merger, into a large QLCS with the tornado near the inflow notch. By 2302 UTC the low level mesocyclone has weakened as the storm occluded. The debris signal, however, still remains. There is a lag with TDS – they appear after touchdown and they disappear after dissipation. The storm went on to do major wind damage across the Capital District as the developing QLCS bowed out. 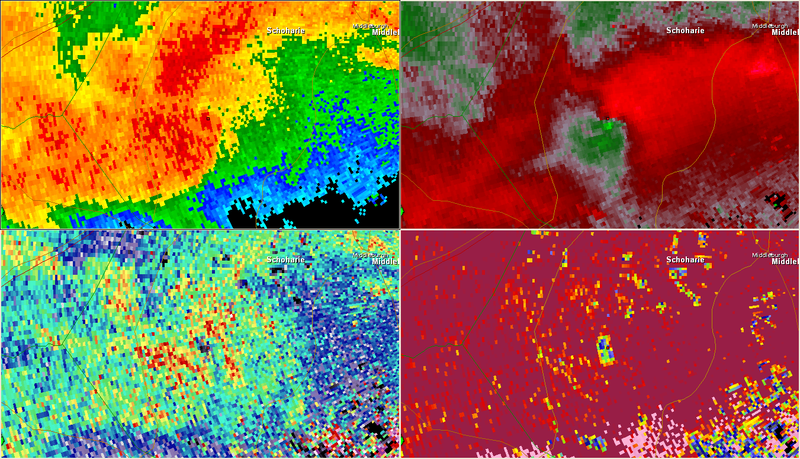 The resulting QLCS still shows some supercellular characteristics after merger with the mesocyclone persisting near the bow head. Supercell/QLCS mergers aren’t terribly uncommon and there are several examples in the literature. 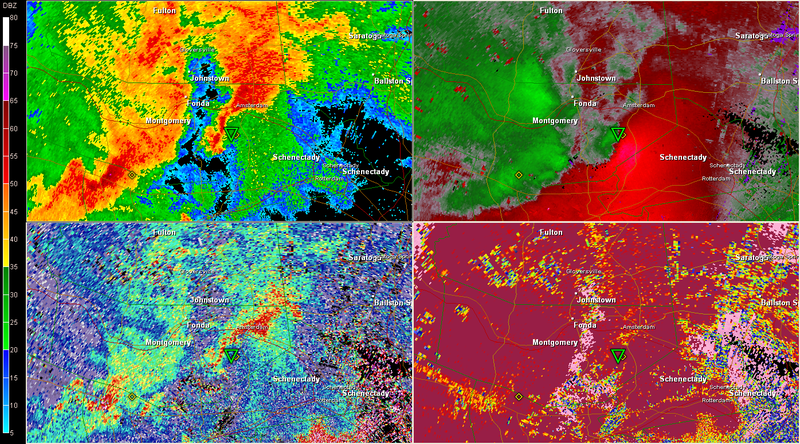 In this case it appears there may have been a touchdown prior to merger on the Montgomery/Schenectady County line near SR-30 and then again during the QLCS/supercell merger near Mariaville, NY to near or just west of Rotterdam. 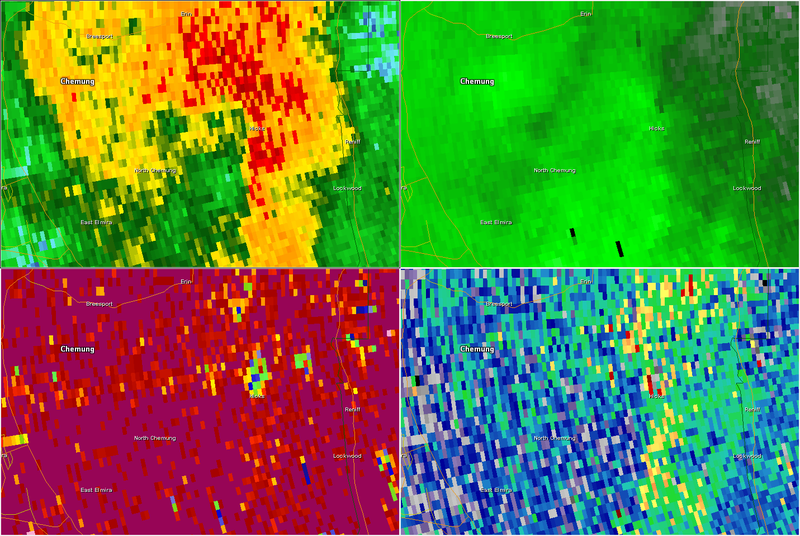 All of this is based on radar – we’ll know more once the NWS damage survey is done. Thankfully the TDS occurred after the circulation moved over sparsely populated areas. It’s entirely possible that the outflow and merger from the QLCS helped aid in tornadogenesis and the sudden onset of a severe and damaging bow echo. 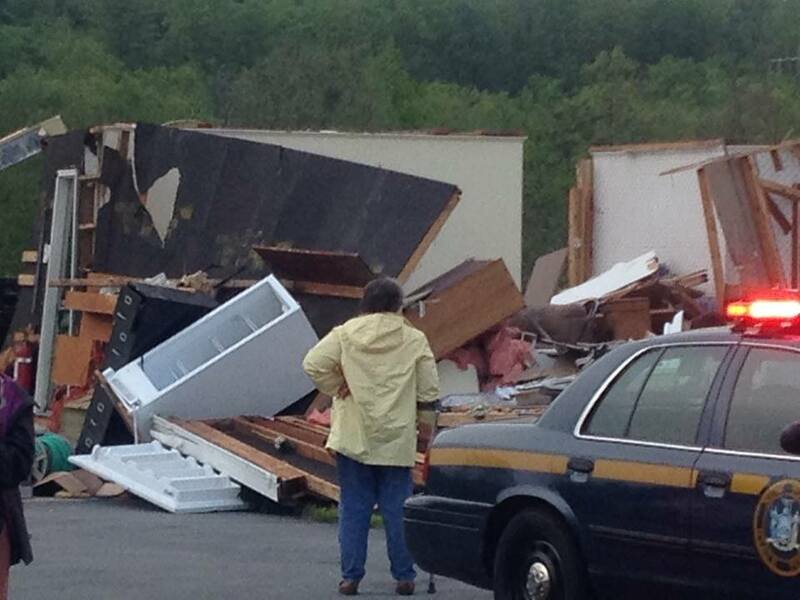 The tornado in Schoharie County also was in a sparsely populated area. This tornado was not from a supercell but rather a QLCS. While there was some very weak/broad mid level rotation prior to tornadogenesis this case appears to be from non-descending mesocyclone/QLCS. Prior to tornadogenesis you can see a pretty sloppy looking QLCS. A relatively unimpressive surge of 40-50 knot inbounds on base velocity north of Stamford and just south of that gold diamond preceded tornadogenesis. A weak bowing signature may be present on reflectivity here at 2252 UTC. 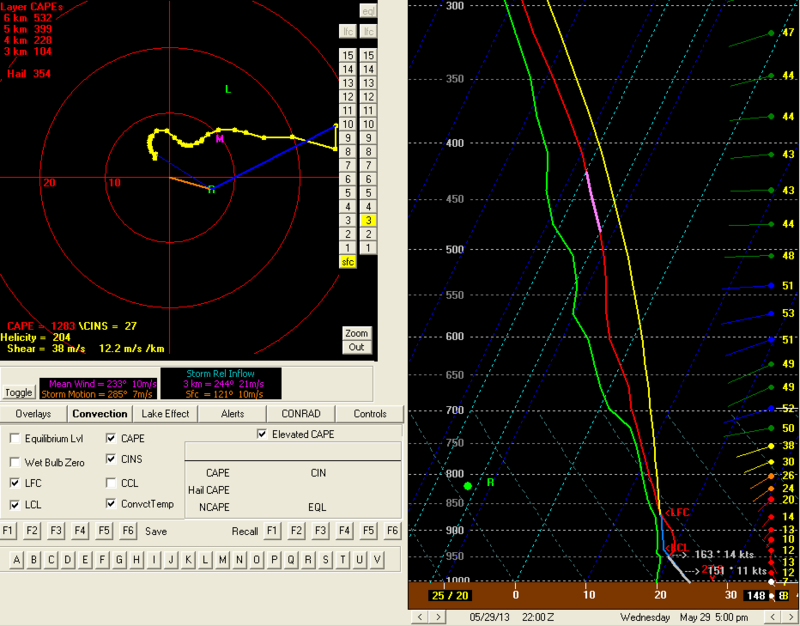 Nothing really jumps out at you and looking aloft there’s no mesocyclone that would be of concern. By 2257 UTC, however, a tornado vortex signature has developed with around 80 knots of gate-to-gate shear near Arabia, Jefferson, and Eminence New York. In addition, the mesocyclone has developed from the bottom up, rapidly strengthening through 11,000 ft AGL in just one volume scan. This seems like a classic QLCS tornado case with vertical vorticity enhanced by boundary layer convergence on the leading edge of the QLCS. In this volume scan you can also see a notable inflow notch that has developed which is characteristic of QLCS tornadoes. By 2302 UTC you can see a crystal clear tornado debris signal with high Z, low CC, and near 0 ZDR. 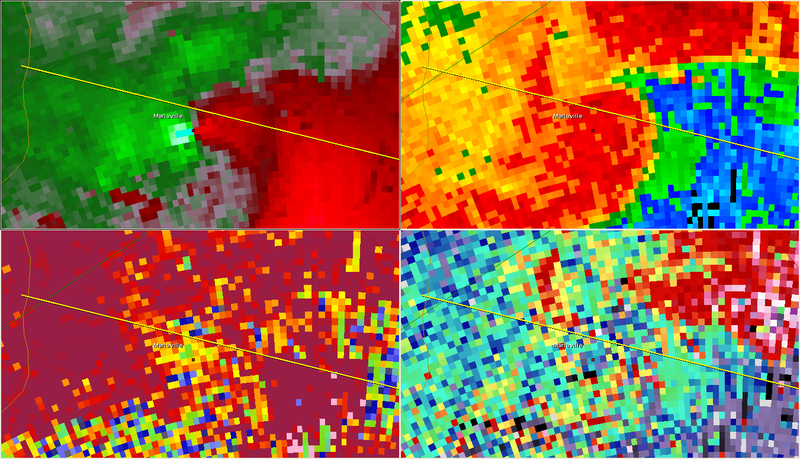 By 2307 there is still a semblance of a TDS but the signal has clearly weakened as has the level level rotation. 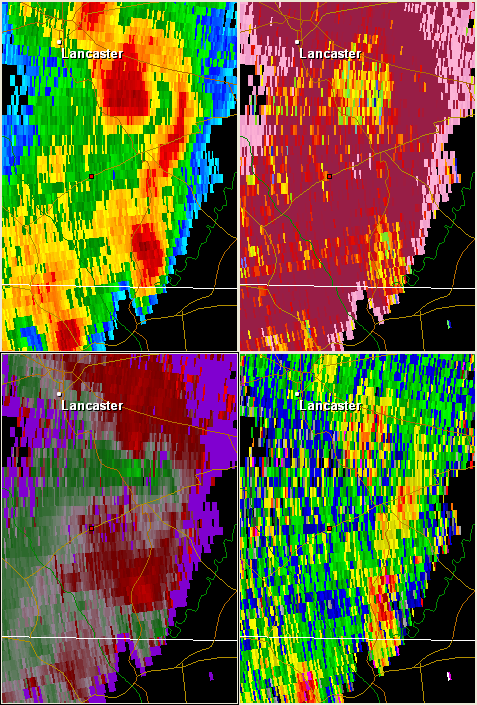 In the northeast I’ve been very impressed by the ability of radar to pick up tornado debris from even weak tornadoes (see Lancaster County PA TDS). The large areas of densely forested land likely helps – as soon as a tornado starts messing with trees parts of twigs and leaves immediately get lofted. Over the coming years I wouldn’t be surprised to see a noticeable increase in tornadoes that wind up being reported and confirmed in our region. We now know when a tornado has touched down and has started to do damage – even if it was miles from the nearest home or road. Let’s hope the damage surveys today show that these tornadoes touched down in very rural areas and didn’t impact property.